Since launching 13 years ago, Loeffler Randall has built a reputation as a go-to brand for the most stylish of It-girls. And now, NYC’s fashionistas are being given the special opportunity to take a peek behind the scenes, as the brand launches a Pop-Up Salon at their headquarters. There, customers will get to try on the most extensive assortment of styles from Loeffler Randall’s latest collections, along with an inside look at where the brand’s accessories are designed. We chatted with Creative Director Jessie Randall about the Pop-Up Salon, what makes it special and why it was the right time to create a more intimate connection with customers. 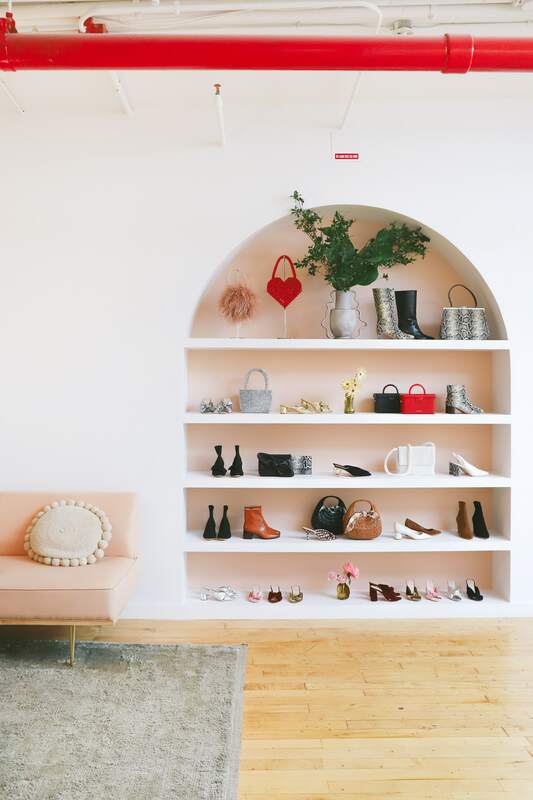 You just launched a Pop-Up Salon at the Loeffler Randall headquarters where guests can explore the latest styles and get a behind the scenes look at your design process. Walk us through the overall experience. JESSIE RANDALL: The Pop-Up Salon is an opportunity for our customers to see our office, where we design every shoe and handbag, and meet members of our tightknit team. We also have full size-runs of key styles from our fall and resort collections, so we’re able to make sure everyone leaves with the perfect fit. It’s a relaxing, fun space and we encourage everyone to take their time and try different styles. Why do you feel it was important for your customer to have this special access? JR: Since we don’t have our own standalone store yet, we are eager to find new ways to meet her in person. Our office is a real extension of who we are as a company, so it feels fitting to welcome our customers here rather than finding a temporary space for a pop-up. What do you hope guests take away from the experience? JR: I hope our guests leave the salon feeling like they understand Loeffler Randall and what we stand for—that we’re a small, family-owned business local to New York with roots in female craft and creativity. Hopefully they find the perfect pair of shoes, too! Shoppers will get a first look at the Resort 2019 collection. What was your inspiration for the collection? JR: The Resort collection is exciting because it offers a great mix of everything I think people are looking for this season—boots and pumps to wear now, gorgeous shoes to wear to events, and cute styles to take on vacation or wear in warmer weather. We were inspired by fresh patterns like python and gingham, creative touches like a round metal heel or resin handle, and the items we knew we’d want to wear right away, like our new Grant boot in cognac leather. What are your top style tips for the woman purchasing a pair of shoes from the Resort 2019 collection? JR: It’s always so important to listen to your gut and follow your own personal style. Some trends we’re loving this season include python (our python embossed leather pieces are an amazing neutral for the fall and winter), sequins and metallics to pair with pretty party dresses, and (of course) the return of the tall boot, which looks gorgeous paired with a long, flowing dress or skirt. Being based in New York, how does the city inspire you and your creativity? JR: I’ve lived in the city for 20 years and continue to find inspiration in the network of women I’ve built in that time. I’m always inspired by seeing what my friends are doing—whether they work in the fashion industry or something completely different. I also continue to push myself to learn new skills and try different creative projects. Right now, I’m taking sewing lessons and a memoir writing class. The Loeffler Randall Pop-Up Salon is open now through Thursday, November 15 at 588 Broadway, Suite 1203, Tuesday through Thursday, 12 p.m. to 7 p.m.